So many of our fellow Alabamians are suffering after the devastating tornadoes of Sunday, March 3. As of today, 23 people have died as a result of this horrible disaster. 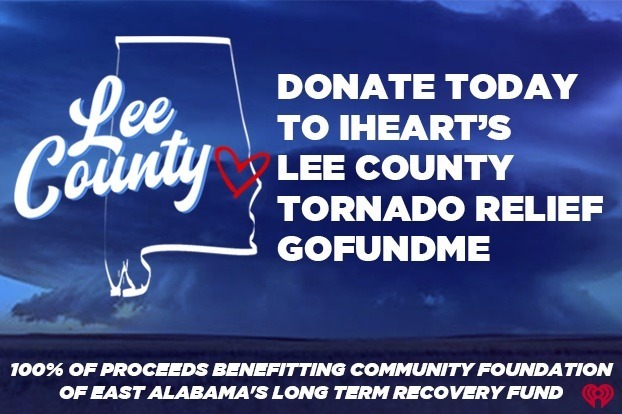 100% of this GoFundMe's proceeds are benefitting Community Foundation of East Alabama's Long Term Recovery Fund. Your gift will not only help with immediate needs like food and shelter, it will also put people on the road to recovery and guide communities as they better prepare for disasters. This GoFundMe drive is organized and operated by iHeartMedia markets in Alabama (Auburn, Birmingham, Gadsden, and Tuscaloosa). Any questions or concerns can be directed to iHeartMedia Birmingham Marketing Director, Melissa Dikau: melissadikau@iheartmedia.com or (205) 439-8194. The Community Foundation of East Alabama was incorporated in 2007 as a 501(c)(3) tax-exempt organization. As a local center for philanthropy, the Community Foundation works with individuals, families, corporations, private foundations and nonprofit organizations to help them carry out their charitable objectives and address emerging community issues. Donors to the Community Foundation also benefit from the Foundation's combined assets which greatly reduce investment and administrative fees. Our five county region includes Lee, Chambers, Macon, Russell, and Tallapoosa. 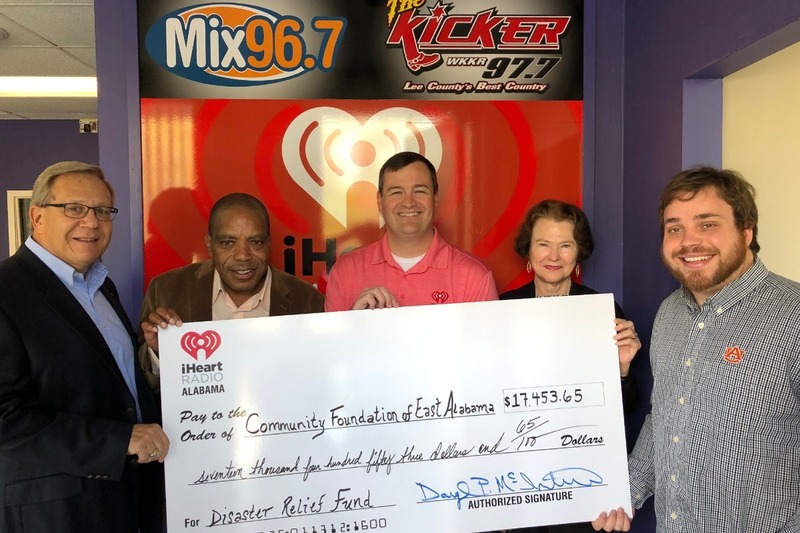 iHeartRadio Alabama presented Community Foundation of East Alabama in efforts for tornado relief (L-R, Market President- Daryl McIntire, Morning Host WZMG 910am- Richard LaGrand, SVP Programming- Van Riggs, Community Foundation of East Al Executive Director- Barbara Patton, Mix 96.7 PD- Donny Blankenship).